Mr.Zingo likes to draw Dragon and Phoenix. He does not have any reason if he likes it. He said old style of Japanese plaster is not alive. The face is dead. So, his point is the face if it is alive or not. 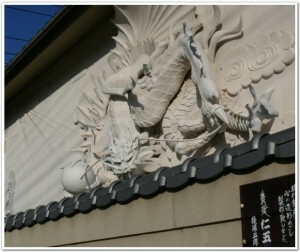 He created original style of Plaster art. Japanese Plaster art is called KOTEE. KOTE means “one of tool for plastering work”. E means drawing or painting in Japanese. He does not like to do normal or if it is not fun. Absolutely incredible. What grace and beauty. Thank you for your comment. I will tell Mr.Zingo. He is interested in expanding his art. So, I am supporting his way. Oh, here is more arts you can see bellow.